The Bloustein School Office of Business Administration and Human Resources provides administrative support to enhance, encourage, and foster value adding activity and initiatives that impact the teaching, research, and public service missions of the School. These include business affairs; budgeting and financial analysis; grant and contracts administration for pre- and post-award activity; human (faculty and staff) resources; organizational development; strategic planning; and institutional research. Committed to providing administrative excellence and efficiency, the Business/HR staff strive to deliver client-focused services that are proactive, supportive, reliable, deliberate, responsive, cooperative, and trusted. 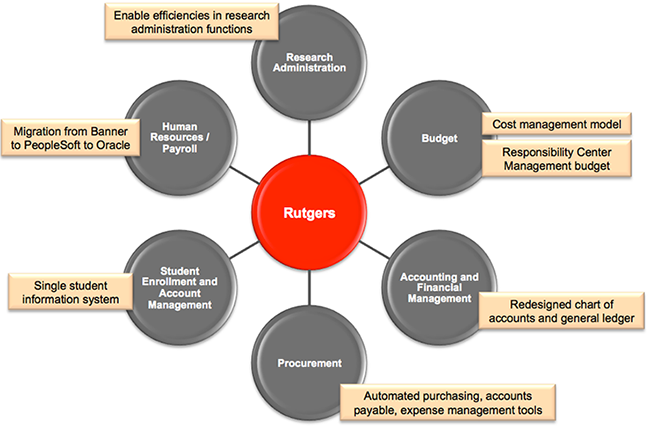 Cornerstone is a multi-year strategic project to transform the administrative information systems and processes for Rutgers University. It lays the groundwork to modernize, unify, and simplify our finance, human resources and payroll, procurement, and expense management systems and processes. This is a pivotal move toward creating a single identity and culture, standardizing practices, and improving collaboration across Rutgers University–New Brunswick, Rutgers Biomedical and Health Sciences, Rutgers University–Newark, and Rutgers University–Camden. We are transitioning from a paper-based expense management process to a best-in-class, streamlined, and automated online system for expense management. Leveraging the new functionality available through Oracle’s Cloud-based expense solution will enable the University to build on existing knowledge and capabilities. The new expense system will be integrated with other business functions, such as financial management, projects and grant management, and procure-to-pay. Click the link at the end of the video to request your account.